What readings should I see from my TPMS? Without knowing the target Cold Inflation Pressure for your personal application, I can only provide some general guidelines to establish the operation of your system. First off, I recommend that TT with multi axles run a CIP equal to the tire inflation on the side of the tire associated with the max load. This may match the tire placard but you need to read your placard to confirm the numbers. Motorhomes and other motorized vehicles can use the measured load on the heavier end of each axle to consult published Load & Inflation tables to learn their MINIMUM CIP. For motorized vehicles I suggest a CIP pressure of at least 10% above the minimum number shown in the tables. Let's assume your CIP is 80 psi, as on most Load Range E tires. One time you need to check your inflation with a good digital gauge and confirm the hand gauge reads 80. Note the tires should be cool and not driven on for at least two hours and not in direct sunlight to get an accurate reading. Having confirmed the tires are at 80, you can then check your TPMS monitor to see what it is reading. I would not be surprised to see pressure variations of +/- 2 to 4 psi. Remember, TPMS are primarily designed to warn of a loss of pressure, not to be a substitute for hand pressure gauges. Most TPMS are set to warn when pressure has dropped 15% from the CIP. I prefer to get a warning before tires get that low so I would set the "base level" of my Tire Traker system at about 107% of the 80 psi on my rear tires to 85 psi. This works out to 72 psi low pressure warning rather than 68 psi low if I went with the original 15% loss number. 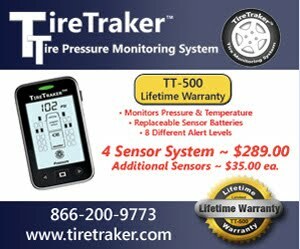 Now my TPMS gives both a Rapid and Quick Early warning when the pressure drops 3 psi from the HOT operating pressure in about 2 to 10 minutes. You will need to learn the details of your early warning settings if you run a different brand TPMS. This early warning is not affected by my CIP or Base Level settings, as it is based on a drop from the actual hot operating pressure. You can expect to see your HOT pressure to be 10 to 20 psi above your CIP, but this depends on your actual inflation, load, driving speed and road conditions. You can also expect your operating temperature to be +10 to + 30 above ambient. Since the sensor is external to the tire, it is cooled by the outside air so will never read that actual internal tire temperature. So, in my opinion, if you see +30, you need to slow down and maybe even park for 1/2 hour or so to let the tires cool off. While there are many variables, I would not be surprised to see external TPMS temperature readings to be 10 to 30° cooler that internal tire temperatures so I would consider a +30° reading to be high. After you drive for a few weeks with your TPMS, you will learn the variation in the readings and should not be concerned about minor variations in the reading. Hope this helps you understand your TPMS and how to get the information you need from it. "Why do so many RV tires seem to be failing?" Well, that may seem to be a reasonable question but in my opinion it is based on what is often inaccurate failure analysis. In reality, tires fail for a relatively small number of Root Cause reasons that can be discovered, but it does require detailed and sometimes exhaustive investigation. By "Root Cause," I mean the initiating feature or condition that eventually led to the failure. Too often people confuse the tire's ending condition with the initiating or "Root Cause" reason for the tire to end up in the condition they are observing. For the last few years of my 40-year career as a tire engineer, my primary job duty was to investigate failed tires that had conditions that were hard to understand or provided confusing and sometimes contradictory evidence as to the Root Cause for their condition. With that background, I have developed some guiding principles for the most likely reasons for tires to fail. 1. External Damage. These include punctures, cuts, impacts, wheel and valve failures and similar conditions. 2. Run Low Flex Failure. This is best described by the failure of the tire sidewall due to excessive flexing. The flexing is the result of operation when the tire is significantly under-inflated. 3. Belt & Tread Separations. This is when the belts of a radial tire detach from the body or from each other and/or when the tread rubber detaches from the top belt. 4. Manufacturing Defect. For the purpose of this discussion this would be when components of a tire were not manufactured to intended specification. The "Why" for some of these are obvious, such as the External Damage category. Others can be further traced to various contributory reasons. Run Low Flex Failure This is a more accurate description of what some incorrectly call "Blowout". When a tire looses significant inflation air they flex much more that the body cord can tolerate. Excess heat is generated which can, in extreme cases, result in the Polyester actually melting. I showed examples of what this can look link in THIS post. Polyester is used in most Passenger, ST type and LT type tires. Steel body tires are used on most Class-A RVs, the steel can fatigue. I covered "Zipper" failures and steel fatigue in THIS post. Belt & Tread Separations occur primarily because the rubber around the belt cords or between the belt rubber and the tread rubber isn't strong enough. Now it can be weak for a variety of reasons. Some might be design, some might be manufacturing and some weakening can be caused by cumulative improper service conditions. Now let's talk about tires made by a reputable company, i.e., one that has tire stores and dealers with physical stores and sells tires that have a warranty of two or more years. If this tire is subjected to thousands of miles of lower inflation or higher loading or operation at higher speeds or stored is full sunlight it is reasonable to expect the strength of the belt & tread area rubber to loose a good portion of its strength primarily due to the increased operating temperature of the tire. If this tire is in service on a tandem axle trailer then there is also increased Interply Shear which can overload the belt area rubber. The combination of the above may result in a belt or tread separation. Another possibility is a Manufacturing Defect. These usually occur in small numbers as tires are built in batches so the substitution of the wrong type of rubber may cause tires to fail. It is important to understand that in almost all cases this type of "defect" usually shows up at early life of the tire. It is also very important to understand that unlike some lawyers, engineers deal in facts and logic. Simply having a tire fail is not in it self proof of a defect but all to often that is the position that those in the legal profession seem to jump to. That approach may result in a nice payout to the lawyer but will not result in product improvement as there has been no determination or identification of the actual initiating "defect". Finally there is the possibility of a design weakness. Now I do not believe that anyone is intentionally designing tires to fail but this sometimes may occur when the performance goals of the manufacturer are limited to meet the bare minimum for strength and durability and the focus is primarily on low cost. There is no absolute way to identify these tires but I do believe there are indicators when looking for tires that are made to a higher standard of quality and durability. I would consider a tire company reputable if it had a chain of stores across the country. If the tires carry the name of the manufacturer and have a multi-year warranty the longer the better then they probably have higher durability requirements than those established by DOT. For ST type tires I would look for tires with a Speed Symbol of "L" (75 mph) or faster. Now a side point about speed. I did a POST a little while ago on the topic and strongly recommend you read it. I do not think I would recommend any tire for general use that does not have a speed rating molded on the sidewall. I do hope this post will help some to have a better understanding of what can contribute to tire failure and consider what you can do to lower the chances of having such a failure. I had posted my comments on the thread from my Aug 25 post on CIP in the hopes of clarifying questions about adjusting inflation for various changes in ambient temperature, but there have been comments that indicate the need for more details when talking about tire temperature so here is a bit more info on the topic. We really have two different but related temperatures to consider. One set of temperatures is the external set. This would be the "Ambient" temperature of the air around us and the temperature of the road surface. The other and much more important temperature is the temperature of the tire structure. Now with the correct instruments, it is possible to measure the temperature of the tire structure. This is done at test tracks and at race tracks using a small needle probe that sticks into the tire rubber 1/8" to 1/2" deep depending on the tire type & size and gives a reading the engineers use to make adjustments to race car suspension or to tire pressures. Since good & accurate tire "Needle Pyrometers" cost a couple hundred bucks, few individuals have them. Some think a simple IR gun from Harbor Freight is OK but all that does is give the approximate surface temperature of a tire which is always cooler than the important internal structural temperature. Rubber is an insulator so heat does not move through a tire structure from hot to cool very well so you can mislead yourself if you only use surface temperature. The IR gun is fine for conductive materials such as metal in a hub or brake drum. Heat is generated at the molecular level not from belts rubbing against each other. This heat moves slowly from the hottest location (belt edges) to cooler surfaces. There is the surface of the air chamber and the surface on the outside of the tire. The air on the inside of the tire gets warmed from the heat transfer from the inside surface of the tire. This air is also cooled by transfer to the metal wheel and the turbulence inside the tire means the temperature of the inflation gas (air) is fairly uniform. The inside temperature is related to the outside temperature in that cooler outside temperature allows faster heat transfer from inside to outside so the inside temperature will be a little lower when the outside is lower but not in a 1:1 relationship. Tire pressure will increase as described by Boyle's Law PV=NRT. I did the math proof in my blog post of March 13 2014 . 2. More deflection due to more load or less inflation or both, results in more heat in the tire structure. 3. More speed means greater generation of heat. This is one reason tires have speed ratings. 4. If you lower the CIP you will generate more heat and this will hurt the rubber and eventually weaken it. 5. With sufficiently low inflation or sufficiently weakened rubber the heat will increase at a faster rate than it can flow out of the tire structure and can go into "run-away" increase which can result in a sidewall flex failure or "Blowout" due to shorter term low inflation or possibly a belt separation due to long term heating and weakening of the belt rubber. I hope this clarifies and answers any additional questions.